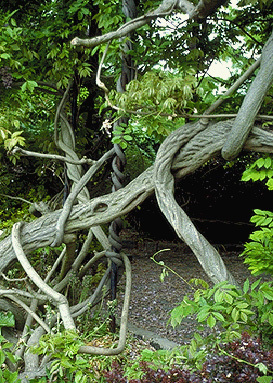 Wisteria floribunda is a high climbing woody vine with stout trunks, twining up large trees, new growth often prostrate, traveling many meters over forest floor, rooting at nodes, bark gray, granular. Leaves alternate, pinnately compound, leaflets 13-19, hairless when mature, 4-8 cm egg-shaped, tip long-pointed, base rounded. Wisteria floribunda. vine.John R. Seiler.Virginia Tech. Forest Resources and Environmental Conservation.dendro.cnre.vt.edu (Accessed 5/2014). Flowers pale blue-purple, 1.5-2 cm, irregular, fragrant, in grape-cluster-like inflorescence to 20-50 cm, blooming gradually from base to tip of inflorescence; blooms April-May. Fruit pods densely gray-velvety 10-15 cm, narrowed toward base, seeds flattened (Rehder 1986). Escaped occasionally, seeds possibly also dispersed by birds or squirrels to new sites. Habitat: Woodlands and edges in part shade or open areas, edges of swamp forests, open uplands and near old house sites. Notes: Very destructive even to tall trees, vines high-climbing, heavy, smothering & breaking vegetation. 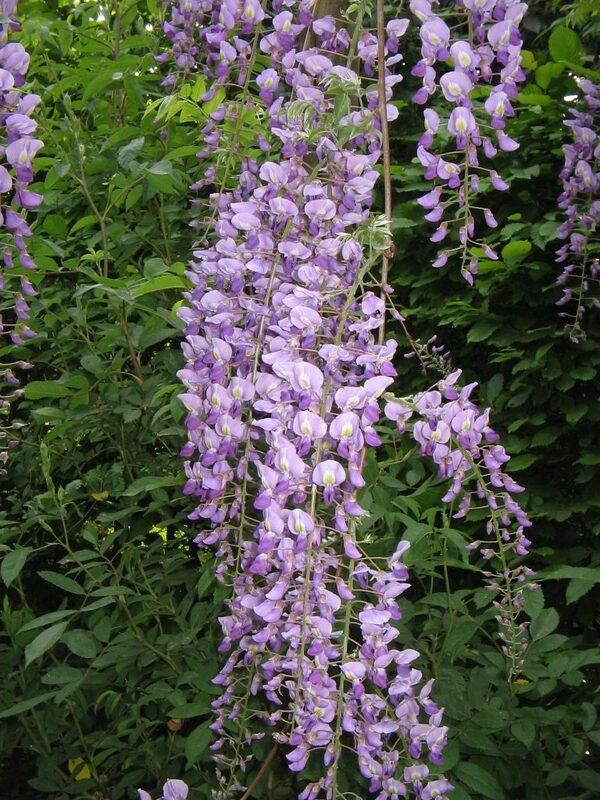 Spreads aggressively by root sprouts, quite shade tolerant (personal observations).